Carboplatin binds to DNA in a cell’s nucleus. The DNA damage caused by carboplatin results in cell death. It is an "alkylating agent". The platinum agents form strong chemical bonds with thiol sulfurs and amino nitrogens in proteins and nucleic acids. Platinum and platinum complexes and compounds find use in industry in alkylation reactions too. Inside the body carboplatin undergoes a chemical reaction with water intracellularly resulting in the generation of a positively charged species that attacks nucleophilic sites on DNA. This is the alkylation action of carboplatin that hinders the growth of the tumor by stopping division of cancer cells. The carboxylate group on the carboplatin molecule makes it more soluble than cisplatin and slows down hydrolysis. This alters the toxicity profile. Chemotherapy with cytotoxic anticancer agents is a mainstay of cancer treatment. Analogs of cisplatin include carboplatin, oxaliplatin, and nedaplatin, Carboplatin has been the most successful of these second-generation drugs. 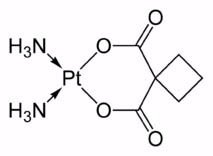 Carboplatin and cisplatin work in similar ways, forming an identical type of adduct with DNA. They attack tumors similarly but carboplatin is less toxic to the nervous system and the kidneys. Carboplatin also stays in the body longer. It has a half-life of 30 hours versus cisplatin’s 3 hours. Lower doses can be given to get the same effect on the tumor, and this reduces the challenge to the rest of the body. Cancer patients often show disease after the surgical resection of the tumor, most probably due to micro metastases from the primary lesion prior to surgery that are not detected by traditional radiological techniques. That’s why chemotherapy is used after resecting the tumor for eradicating the tiny lesions of the tumor cells. More on treatment with carboplatin.